OH rang me at work, he was very upset and thought Susan was hurt. I came hot footing it home. The moral of the story is not to give white rabbits beetroot! It is much clearer in real life lol. 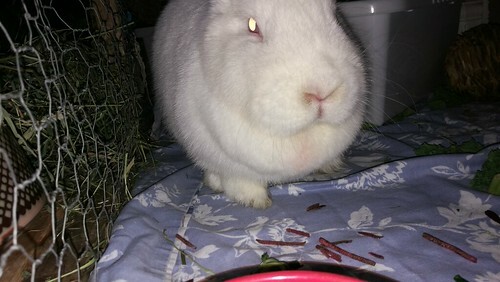 Having never had a girl before, will her dewlap go away? I know she had over 100 babies for the meat trade but that mound under her chin is mahoosive. Mouseys is down to her knee caps. When she lays down for a load my Mum & Dad take the pee & have nick-named her hovercraft bunny. So it is natural, I thought the dewlap was for producing fur for nesting. I will try and get a photo of her's as it is huge. Does Mouse really have one too?